Distributors « Global Market Insights, Inc. The global automotive communication technology market has lately been emerging as a highly pivotal vertical of the overall automotive space, primarily owing to the robust innovations pertaining to automotive electronics. Incidentally, post the introduction of electronic control units (ECUs) in the automotive industry, vehicles had begun to come equipped with numerous wires, circuits with enormous dedicated wiring, which led to complex, bulky and expensive wiring equipment. However, with the deployment of noteworthy advancements, the technologies used in automobiles have transformed drastically, paving the way for the expansion of automotive communication technology industry. According to statistics, about 95% of automobile fatalities are caused by driver distractions. If all the cars could communicate their status with each other, automotive systems would ideally be able to alert the driver and respond on its own preventing any kind of collision. Having considered the plausibility, the California based chip maker Qualcomm Technologies had announced 9150 C-V2X cellular vehicle-to-everything (V2X) chip last year. This chip was able to send and receive information directly from the cars nearby about sudden braking, slippery roads, speed, signal and more. The vehicle-to-everything (V2X) communicates directly with nearby cars, which includes vehicle-to-infrastructure (V2I), vehicle-to-pedestrian (V2P) and vehicle-to-vehicle (V2V). Qualcomm’s product launch bears testimony to the fact that vehicles integrated with advanced technologies are likely to reduce automobile fatalities, which would further encourage automotive communication technology market players to work on their existing product portfolios. It is rather overt that advancements in automotive technology, such as ECUs sharing information and cars equipped with the ability of communicating with each other and the cloud, would raise the possibility of car-hacking. The threat of hackers invading any vehicle via a single ECU, and then taking control over the vehicle or stealing personal information is expected to be a crucial issue in the years to come. To tackle such issues, the second-largest Germany-based manufacturer of automotive chips, Infineon Technologies, introduced its trusted platform module (TPM) which is targeted at automotive ECUs. The Optiga TPM microcontroller would assist manufacturers in detecting manipulated software or faulty components running inside the vehicle. Such efforts taken for increasing safety of the automotive systems would further drive their adoption paving way for the expansion of the automotive communication technology market. As of now, the circuit manufacturers are trying to make the infotainment systems more flexible to transport packet, stream and control content. Implementations that already exist are either complicated and costly, or quite limited in bandwidth with packet data capabilities for supporting internetworking requirements and system updates. Owing to the aforementioned glitch, the leading provider of microcontrollers and circuits, Microchip Technology Inc., has recently launched an efficient automotive infotainment networking technology called ‘Intelligent Network Interface Controller networking (INICnet) technology’. It is a scalable, synchronous solution which largely simplifies building audio and infotainment systems. Utilization of such features in the vehicles enhances the infotainment systems and their features as well as increases its demand. To tap into this segment, a subsidiary company of NXP Semiconductors has surged its production of automotive and specialty chips in its Singapore facility, with an investment of S$300 million. The chipsets produced in this facility are used by the automotive manufacturers in car infotainment, vehicle to infrastructure communications and more. 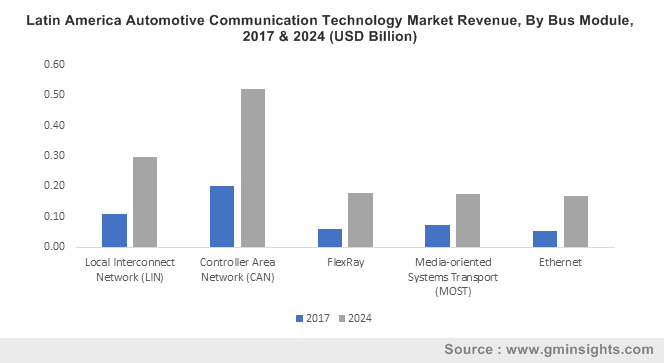 With such efforts undertaken by key industry players, it is evident that automotive communication technology market would depict a notable growth rate in the upcoming years. Comprising prominent companies such as Intel, Vector Informatik, Rohm Semiconductor, Broadcom, Toshiba, Texas Instruments, Robert Bosch and more, the competitive spectrum of automotive communication technology market is quite diverse. For the record, Global Market Insights, Inc., anticipates this industry to exceed a valuation of $18 billion by 2024. This entry was posted in Automotive & Transportation and tagged Automotive Communication Technology Market, Automotive Communication Technology Market Size, Body and Comfort Electronics, Bus Module, CAN, Controller Area Network, Distributors, Ethernet, FlexRay, Global Automotive Communication Technology Market, Infotainment and Communication, LIN, Local Interconnect Network, Media-oriented Systems Transport, MOST, OEMs, Powertrain, Safety and ADAS.